Submitted by Alexander Briones on Dec. 23, 2018. First published on December 8, 2016 and last updated on December 24, 2018. NB: We only recommend wireless systems that are compliant with the FCC regulations that will come into effect in July 2020. Hearing yourself well can often spell the difference between mediocre and inspiring performances. This is exactly what In-Ear Monitors (IEMs) are for, allowing you to personalize the way you hear yourself and your band, sent directly to your ears. In addition to the targeted control that they provide, they also allow for very low stage volume, making it easier to manage the overall sound. Furthermore, thanks to the convenience of wireless technology, more and more professional musicians are switching to IEMs. Here we present you with the Best In-Ear Monitor Systems, based on updated research data up to December 2018, along with tips on what to look for to address your specific IEM needs. 85 out of 100. Incorporating 50+ ratings and reviews. Audio-Technica is known for producing reasonably priced audio equipment that both hobbyists and professionals appreciate and the M2M is an excellent example. Among their lineup, the Audio-Technica M2M sits in the sweet-spot where price is accessible for beginners while quality is good enough for experienced users, which in turn allows it to maintain its high ratings. This bundle includes the M2L transmitter with 100 user selectable UHF frequencies, and the M2R receiver which lets you mix two independent signals right at the receiver pack. This configuration gives direct control to the performer, ideal for bands who don't have a team of techs to mix their sound for them. Other features include three rubber eartip sizes and the ability to use up to 10 complete M2 systems simultaneously in one venue. Transmitter Input: 1 x XLR, 1x 1/4"
Transmitter Output: 1 x XLR, 1x 1/4"
Users and experts agree that the Audio-Technica M2M sounds great and performs well within expectations. Many customer reviewers commented that it has a lot of headroom, while the wireless range is good enough for the usual stage sizes. Some experienced users appreciate the M2's expanded input/output options. Most of the positive feedback came from vocalists, but other musicians also chimed in with their recommendations and high ratings. Some users reported that ear buds feel cheap and flimsy, and recommended the use of 3rd party earphones. To be more specific, one bassist recommended the use of headphones to better hear the low-end thump of their instrument. With its accessible price, flexibility and reliable quality, the Audio-Technica M2 is highly recommended for those who don't want to spend more than $600 on an IEM. 90 out of 100. Incorporating 70+ ratings and reviews. Shure built their reputation on the quality and reliability of their products, and this same principle is at work in the PSM 300. Described by Shure as 'entry level', this IEM system comes packed with features that make it easy to setup, including its one touch frequency scan and IR sync, which automatically finds and assigns a clean wireless channel for the system to use. The bodypack also features mixing control so you can set or adjust your monitor mix and levels the way you want to in real time. Receiver Output: 1 x 1/8"
The positive reviews for the PSM 300 were written by a variety of musicians, including lead vocalists, guitarists, drummers, keyboardists and more. One user aptly put it by saying that this monitor helps him zone in to the sounds that matter, which inspired him to play better and enjoy his performance more. From its clean sound, to its quick and convenient setup, the customer reviews for the PSM 300 are overwhelmingly positive. There a few users who had issues with the ear buds. Battery drain was also raised a few times by some users who warn that when used for longer then two hours, you should have backup batteries ready. If you're looking for a wireless IEM system with Shure's brand of reliability without going above one grand, then get the Shure PSM 300. 86 out of 100. Incorporating 10+ ratings and reviews. Japan based Audio-Technica has come a long way from manufacturing phonograph cartridges back in 1962, now they are considered as one of the biggest audio equipment manufacturers in the world. The Audio-Technica M3M showcases why the company continues to thrive in the face of stiff competition, it packs in impressive features while keeping the price much lower than what other brands offer. The transmitter features an intuitive interface with LCD display, which you can use to mix two signal sources to achieve your preferred monitoring levels. You can have up to 16 M3 systems running on stage without any problems, or you can pair a single M3L transmitter with multiple receivers if you're just going for a single mix. Other features include built-in multi-level limiter and adjustable squelch for controlling annoying static noise. 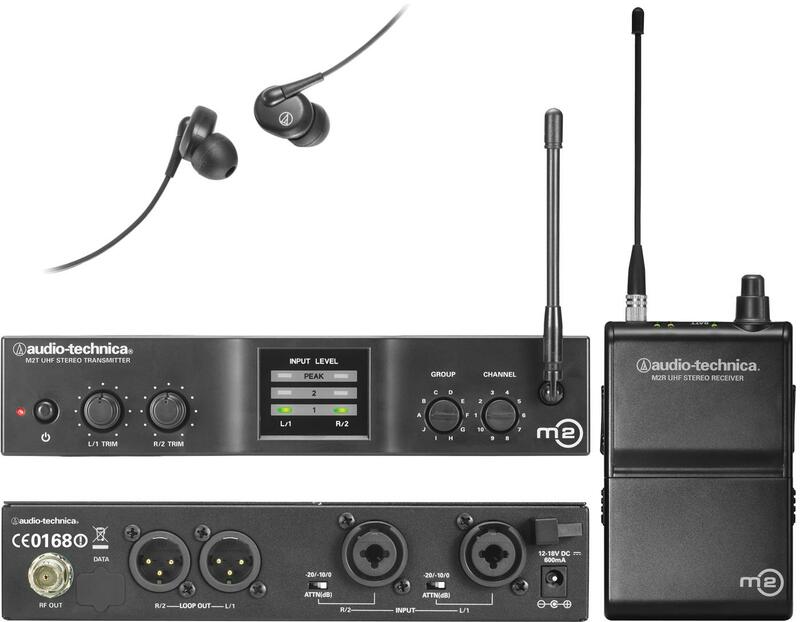 Transmitter Input: 1 x XLR, 1 x 1/4"
Transmitter Output: 1 x XLR, 1 x 1/4"
Reviews have been consistent in saying that the Audio-Technica M3M performs exceptionally well, coming from both new and old users who have been working the M3M for years. Experienced drummers, vocalists, guitarists and engineers have mostly good things to say about their experience, specifically mentioning ease of use and sound quality as its finest features. There are some users who complained about the receiver being bulky, while others find that batteries need to be replaced more often than what they wanted. There were also a few that had minor issues with the antennae, but they still gave the unit high ratings. The Audio-Technica M3 is highly recommend for those who want a pro-level wireless IEM system that is still reasonably priced, yet can be expanded on. 83 out of 100. Incorporating 5+ ratings and reviews. Sennheiser is a familiar brand in professional music circles, rightfully so because they continue to receive acclaim for the quality of their products. They enter this list with the Sennheiser EW IEM G4, a versatile In-Ear Monitor system with multiple channel operation and a wide range of frequency selection. It is designed to work with as many venues and situations as possible, with its wide frequency selection (1,680), up to 61 channels, and up to 42MHz of bandwidth. You can also adjust RF output power from 10 to 30 to 50 mW for a transmission range of up to 330 feet. To simplify setup, it also features automatic frequency scan and adaptive diversity. It also has a nifty lock function so you don't accidentally change your settings. Sound quality gets a lot of thumbs up from owners, also commonly commended is its reliability. There are reports of it working well in various venues and applications, and many are happy with how easy it is to setup. Most users are happy with the bundled earphones, but there are some who report getting better results after swapping them out. If you're looking for a versatile IEM system with Sennheiser's brand of quality and reliability, then check out the EW IEM G4. 90 out of 100. Incorporating 10+ ratings and reviews. There's no denying the popularity and reach of Shure, so it's not surprising to find them entrenched in this list, spearheaded by the PSM900, a versatile wireless IEM with extended connectivity and bandwidth options. This compact wireless system features Shure’s P9T transmitter with Group scan and Sync technology for convenient automatic configuration. There’s also the CueMode that allows for monitoring up to 20 mixes, and MixMode for creating custom mix of two channels. Another nifty feature is called “automatic gain control” which ensures signal reliability and clarity. The included Shure P9RA receiver runs on a rechargeable battery. Most users point to its personal mix capabilities as its major strength, satisfying even the most fickle vocalists and musicians who prefer traditional wedge monitors. The unit's build and sound quality were also mentioned by reviewers, with one even praising the quality and reliability of the power inlets. One expert reviewer described it as amazingly easy to use, thanks to its automatic sync'ing, intuitive front panel controls and metering. 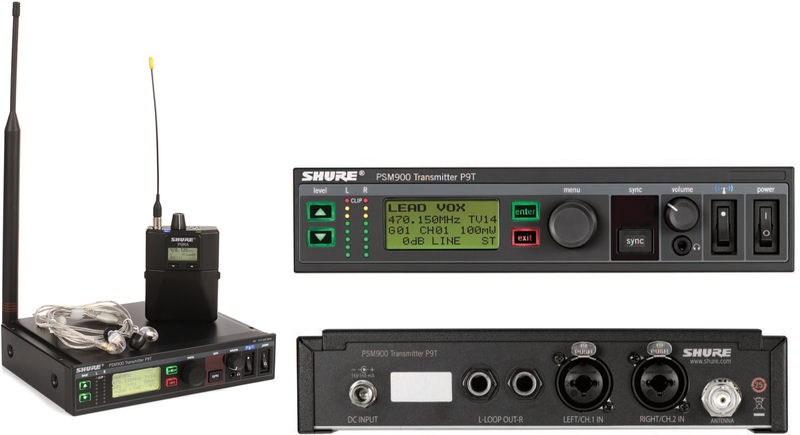 All in all, the Shure PSM900 is highly recommended by almost all of its users. A gig review from FOH Online said, "The performers who used the PSM 900 system all told us that the sound was the cleanest, purest sound they had experienced with IEMs". There was one user who found the antennae to be a bit loose, while another wished that the price was a bit lower. If you're looking for a reliable professional-level wireless in-ear monitor system that you can expand on, then check out the Shure PSM 900. As of July 13, 2020 new regulations from the FCC will come into effect and as a result some older wireless systems will no longer be able to be legally used in the United States. The frequencies that you will no longer be allowed to use from that date forward are 617-652 MHz and 663-698 MHz. All of the wireless in ear monitor systems that we have recommended allow you to operate outside those frequencies and are compliant with the new regulations. For more information read this FCC consumer guide. 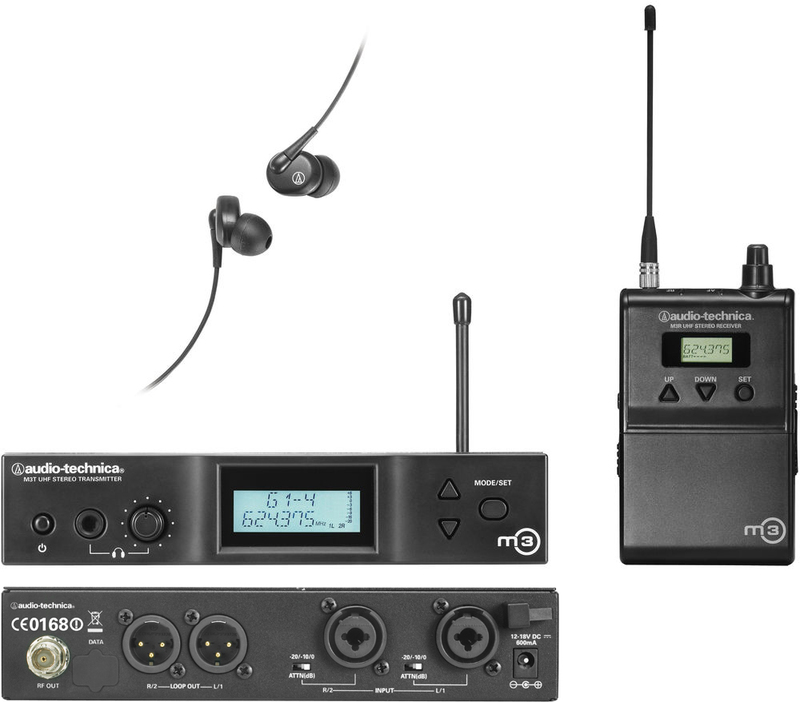 The regulations that apply to wireless microphones also apply to wireless in ear monitors. This allows performers to personalize their own monitoring experience, and make necessary adjustments in real-time, while still giving the sound engineer control when needed. The end result of using this feature properly is hearing yourself better, which when set right, can dramatically improve your playing and performance. This specification details the range of frequencies that the wireless system can operate in. With careful planning, you can use this information to maximize the number of IEM systems that you can simultaneously use on stage, by buying those that can work together. Since these systems operate using unlicensed frequency bands, they can be prone to interference, so the more the range of operation, the easier it is to switch to clean frequencies as you move from venue to venue. Note that some of these wireless systems have alternate versions that operate using different frequency bands. While most wireless systems have built-in automatic scan and sync features, there may be times when you'll have to take control and set frequencies yourself. This specification indicates the frequencies that the earpiece can reproduce. The lower the starting range, the more bass frequencies it can produce, while the top range dictates the high frequencies it can handle. Musicians that need to hear more lows, like bassists and drummers will want to look at those with good low frequency response. Some people even end up replacing the earpiece just to hear the lows better. The earbuds play a very critical role, not only do they play the sound directly to your ear canal, they also have to block out ambient sound and at the same time hold the earpiece assembly in place. Earbuds that are bundled with readily available IEMs are generic, which means that they may or may not perfectly fit your ear, thankfully there are those that offer different sized buds, in case the default one doesn't fit well. To get the most out of your IEM system, you can go for "custom molded" earbuds that are meant to perfectly fit your ear, the caveat is that these personalized ear buds can be expensive. Most IEM receivers are powered by two AA batteries, and since these batteries are widely available, they are the easiest to replace. Still, the cost of having to replace these batteries can add up when the receiver is used on a regular basis. Some manufacturers have opted for built-in rechargeable batteries, which can be cost-effective in the long run. For this 2018 update, we only considered systems that are compliant with the FCC regulations that will come into effect in July 2020 to ensure you'll be able to keep using them long term. We added the most recent reviews and ratings data to the ones we already have, and fed them to the Gearank Algorithm which gave us the scores out of 100 that you see above. These scores reflect relative market sentiment about each system, so we then selected the top 5 to recommend above. For more information about this process please read How Gearank Works. Submitted by Michael P. Naughton (not verified) on Mar. 8, 2017. Edifying and helpful article Alexander Briones and Gearank, thanks. I am sold on IEMS as a vocalist after experiencing horrible sound and technical difficulties at well-known venues. Floor monitors are a thing of the past and a crapshoot for most singers. I have also spoken with other pros and this is the way to go. I got my eye/ears on Sennheiser EW 300 based on your article. Submitted by Alexander Briones on Mar. 8, 2017. Glad to be of help, hope you get the most out of the Sennheiser EW 300. Submitted by Damien (not verified) on Apr. 8, 2017. Why is the MIPRO stuff not on this list? Submitted by Jason Horton on Apr. 8, 2017. We examined the Wireless IEM lists of all the major music gear retailers in the USA and the Mipro brand wasn't on any of those lists. Mipro did win a TEC award a couple of years ago for one of their wireless IEM systems but they didn't qualify for this guide because they're not widely available. Submitted by Sexton (not verified) on Jun. 15, 2017. Did you see anything about UE Pro? Submitted by Jason Horton on Jun. 15, 2017. I don't recall seeing anything specific about Ultimate Ears Pro, and I'm not sure what Alexander Briones saw during our research, but I can tell you they didn't make it onto our short-list. Submitted by Darron (not verified) on Sep. 25, 2017. I use the Mipro 909 system personally, and have the Sennheiser systems at work. I prefer the Mipro, hands down. I agree, not as commonly available, but with the internet, that’s not a problem these days. It’s not hard to find a vender willing to sell you one if you look. Submitted by Ropodope (not verified) on Sep. 8, 2018. Submitted by Bob (not verified) on Apr. 18, 2017. Have you heard any pros or cons on the Galaxy Audio TX and RX system? The price is certainly attractive and the specs are good. Thanks for any input. Submitted by Chris (not verified) on Jul. 21, 2017. Galaxy Audio is often overlooked but an great company with quality audio and customer service second to none. I love that they field their service calls at their home base in central Kansas USA! Shoot just call them if you have any IEM questions they are helpful and not at all pushy. Submitted by Scott (not verified) on Sep. 10, 2017. I'm curious about this, you give Galaxy a very positive review here but don't put them in your list, why's that? You really didn't answer the original question. Thanks. Submitted by Jason Horton on Sep. 11, 2017. You seem to be addressing "Chris (not verified)" as though he works here at Gearank.com - he doesn't work here but I do. Just for the record, to date we have not published reviews of any Galaxy Audio wireless IEM systems on this site. To answer the original question, I'm not aware of Galaxy Audio having any wireless IEM's with the designation "TX" or "RX". To the best of my knowledge their wireless IEMs come with the designation "AS". Only one of their wireless IEMs had high enough ratings to make it onto our short-list for this guide and it didn't rate highly enough for us to recommend it - it was the AS-1100. Submitted by Maryann (not verified) on Jul. 20, 2017. I am looking for a wireless microphone system that includes in ear too. What I need to buy? Submitted by Jason Horton on Aug. 9, 2017. I have also been looking for a single wireless unit that combines both in-ear monitors and a headset mic. Unfortunately I haven't found any yet, or ones with a handheld mic, so at the current time it looks like you have to get them separately which means wearing two bodypacks - not ideal. I'll post back here if I find a better solution. Submitted by Peter M. (not verified) on Sep. 27, 2017. I've been a Shure PSM600 user for over 15 years, and now I'm forced to move on thanks to FCC regulations. All companies reviewed here, with the exception of Carvin, are offering trade-in rebates for systems operating in the 600mhz range, FYI. Submitted by Jason Horton on Sep. 28, 2017. Thanks for the tip - we already have an update planned around this. For anyone that doesn't know - from July 13, 2020 the FCC will not let you operate wireless systems in most of the 600 MHz band. More information can be found at fcc.gov/consumers/guides/operation-wireless-microphones. Submitted by Jason Horton on Nov. 3, 2017. 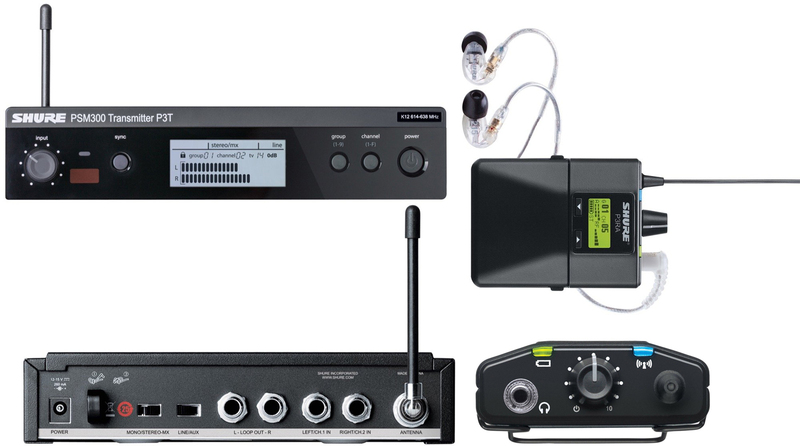 One system was removed from our recommended list as a result of today's update, but you can still read our meta review for the Carvin Audio EM900 Wireless In-Ear Monitor System. Submitted by Kevin Smith (not verified) on Jan. 31, 2018. I am a non believer in the need for an in ear monitoring system with bands on the local level. First, I am old school. 61 years old, and have always performed with traditional wedges. I tried ear buds when they firs came out. Ours were ("hardwired"), and came with zero fidelity, and loads of discomfort. Up to , and including a dreadful inner ear infection for all members. Now, after decades of honing my craft, I am playing in a very high profile local act that requires me using the buds again. I have been loaned a set of SURE 846 ear pieces , and a PSM 900 until such time as I can afford my own. My problem is , while the overall fidelity of the buds have improved over the years , I still find them sorrowfully lacking. I can't seem to dial in my stage mix when playing live. I am well past the introductory period to become acclimated with the buds as they fit and feel, so suggesting the issue is with our set up introduces another annoying problem as we are using the recommended high end, high cost products.Our history would indicate there is no possible solution as two players have re-invested in their ear buds to the tune of some $6000 each ! The molded custom plugs were bought, used twice, and discarded to the dead gear box and accounts for yet another $1550. Understand we have won every award for music in our city for the last 5 years. The crowds are enormous. We hire full sound and lights with the same guys running it for every show. In other words, this old man has got a real cushy gig that pays very well, is high profile, and where I don't have to touch a single piece of gear coming or going ! I have to make this ear bud thing work. If anyone has a sure fix ritual we can perform , PLEASE mail me back with a link. Submitted by Gina (not verified) on Apr. 16, 2018. I'm curious, where do you play? Submitted by Jason Horton on Apr. 16, 2018. There aren't a lot of good systems in the sub $400 price range, but I'll try to help. Probably your best option would be the Carvin Audio EM900 which is currently on special for $379 - read our EM900 meta review here. The LD Systems MEI 1000 hasn't been rated by us so I can't help you with that one, but we did rate the Shure PSM 200 but it's no longer widely available in the USA however here is its rating. Submitted by Gina (not verified) on Apr. 17, 2018. Thank you so much for your advice. I realize $400 isn't much for quality. I may go up to $700. Will the Carvin Audio and the Shure both be for the new rules of 2020? Submitted by Jason Horton on Apr. 17, 2018. The current Carvin Audio EM900 and all current Shure systems are compliant with the new FCC rules, however I can't guarantee that a second hand Shure PSM 200 system will be. Make sure any system you buy does not use the frequency bands 617-652 MHz and 663-698 MHz if you want to be able to use them when the new rules come into effect. Submitted by Larry (not verified) on Aug. 11, 2018. I know this is different but: Have you looked at any of the systems that work with an iPhone that let you mix your own blend? Examples would be PreSonus Q Mix or the X32 rack by Midas? This is still relatively new tech but wondering if it is worth the look? The idea is that each person is responsible for their own mix and can dial in as much or as little of what they want to hear. Submitted by Jason Horton on Sep. 12, 2018. The following system has been removed from the recommended list above due to a lack of availability: Sennheiser EW 300 G3.